Bank of Montgomery is this year’s NSU Tailgate Partner with the NSU Alumni Association, a $5,000 new sponsorship opportunity available to a single individual or business on a first-come, first served basis for the 2017 Demon football season. 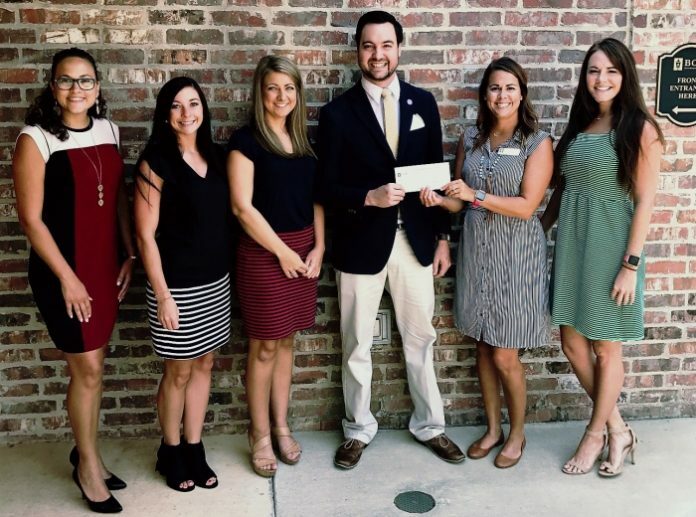 From left are BOM Representatives Lyn Christophe, Micah Foshee, Brooke Latham, NSU Associate Director of Alumni Affairs Vanner Erikson, Carrie Beth Hough and Brandy Tilley. NATCHITOCHES – Bank of Montgomery is the 2017 Tailgate Partner of the Northwestern State University Alumni Association as the university prepares for the upcoming football season. A slate of activities and promotions will surround home football games and tailgating events during the home opener versus Lamar on Sept. 16 and the following home games versus Southeastern Louisiana on Sept. 30, Central Arkansas on Oct. 21 (Homecoming), Abilene Christian on Nov. 4 and Stephen F. Austin (Battle for Chief Caddo and Senior Day) on Nov. 18. This is the first year the Alumni Tailgate has been supported by an official Tailgate Partner, a first-come, first-served $5,000 sponsorship opportunity available to a single individual, company or organization for the 2017 football season. Other Demon Tailgate sponsors are Brookshires/Super 1 Foods, Maggio’s, Cane River Waterslides, Posey’s and Foy Motors at the $1,000 level; Barnes and Noble at the $500 level and City Bank and Trust, Walsh Timber and James Veterinary Clinic at the $250 level. Corporate and general sponsorships are still available and include t-sign recognition, media recognition and other perks. For the first time, the Alumni Tailgate will be combined with both the President’s Tailgate and the Faculty/Staff Tailgate and will take place in and around Collins Pavilion, which has been recently upgraded with new cooling fans and other amenities, according to Vanner Erikson, associate director of Alumni Affairs. NSU’s first home game weekend will kick off with the annual Demons Come Out at Night pep rally in Turpin Stadium beginning at 7 p.m. Thursday, Sept. 14, following by a concert featuring The Molly Ringwalds from 8-10 p.m. on the tailgate field. Those events are free and open to the community and are being planned in tandem with the investiture of NSU’s 19th President Dr. Chris Maggio, which will take place Friday, Sept. 15. Tailgating for Saturday’s game will begin at 3 p.m. with kick-off at 6 p.m.
NSU Alumni Association tailgates take place in and around Collins Pavillion and feature music, food, children’s activities and more. The cost to participate is free to members of the NSU Alumni Association and $10 for non-members. For more information on tailgating or sponsorship opportunities, contact Erikson at eriksonv@nsula.edu or call (318) 357-4415. Information on NSU’s upcoming football season is available at nsudemons.com.